Roof ties embedded in the brickwork. The roof of a house is ultimately what keeps us protected from the elements. This is why roofs need to be waterproof and able to prevent water from accumulating on the surface. But it is just as important for any roof to be able to resist any forces that it would normally be subjected to – particularly wind – which is why you need to anchor any roof structure so that it doesn’t blow off. 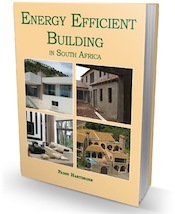 While Part L: Roofs of the National Building Regulations gives guidelines for the way in which roof trusses should be constructed, and the degree to which roofs should slope, it is Part K: Walls that covers (albeit briefly) “roof fixing”, in what is termed “empirical rules for walls”. The legislation states that, “Where any roof truss, rafter or beam is supported by any wall, provision shall be made to fix such truss, rafter or beam to such wall in a secure manner that will ensure that any actions to which the roof may normally be subjected will be transmitted to such wall”. Two strands of 4 mm diameter galvanized steel wire may be used for all heavy roofs, and for light roofs with a slope of less than 15 degrees, and minimum truss or rafter centres of 760 mm. 30 x 1,2 mm galvanized strapping may only be used for light roofs. If the slope is less than 30 degrees, the maximum truss/rafter centres should be 760 mm. 30 x 1,6 mm galvanized steel strapping (which of course is stronger than the above) may also only be used for light roofs, but trusses/rafters may be more widely spaced. The variants for roofs that slope less than 30 degrees are 750 mm, 1050 mm, and 1400 mm. Centres should be no more than 1500 mm if the slope is more than 30 degrees. Roofs are generally classified either “light” or “heavy” according to the material used to finish them. Light roofs may incorporate metal profile sheeting, metal roof tiles, fibre cement fibre sheeting and fibre cement slates. Heavy roofs may incorporate concrete or clay roof tiles, thatch or slates (other than those made of fibre cement). What the bricklayers do is to build the anchors into the wall vertically, at the correct height, in a horizontal joint (see photograph above). The weight of the roof will be carried by the timber wall plate that rests on the internal skin, and the roof structure will be supported by the external walls (or skin) of the house. When the roofing carpenter builds in the roof, he will wrap the ties around the rafter and nail them to the roof timbers. It is important that whichever type of roof truss is used, for the trusses (or rafters) to be evenly spaced. This means the centres must all be exactly the same. It is also vital for the anchors to extend adequately into the masonry. Generally the minimum for heavy roofs is three brick courses (or 300 mm from the wall plate) and 600 mm if the roof is categorized “light”. If the wall is built from hollow concrete blocks, a minimum anchor depth of 400 mm is required for heavy roofs, and generally 600 mm for light roofs. 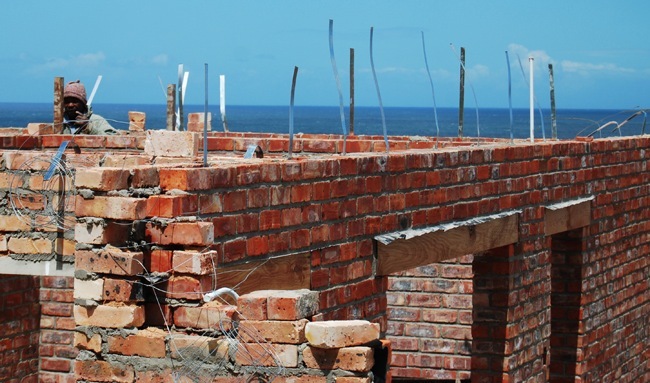 If the block wall comprises either a 140 mm or 190 mm single leaf, and it spans about 8 m, then the anchor must be embedded at 1000 mm into the blockwork. Rafters are horizontal “members” (essentially sloping beams) that form the upper edges of any roof truss. There are different types of rafters, depending on where they are positioned, including valley, hip, common and jack rafters. 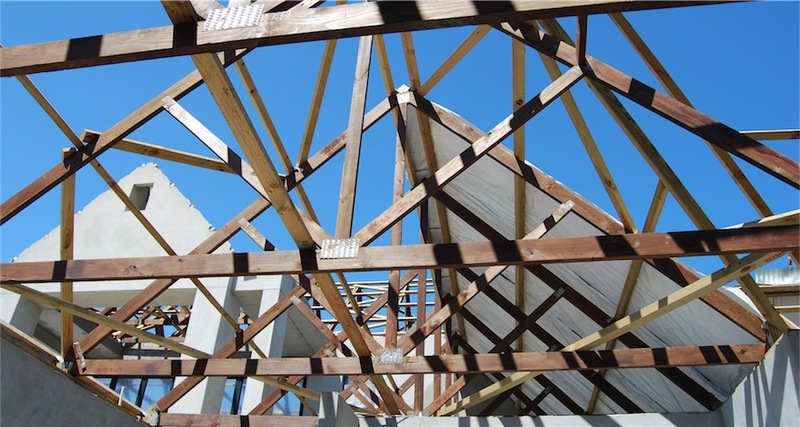 Trusses are rigid structural components (rafters, beams, posts and struts) that are assembled from a number of timber “members” and connectors (usually bolts or nail plates) in a way that forms a pattern of triangles. There are many different truss configurations including king post, fink, Howe, scissors and attic trusses. Roof trusses form a series of triangular shapes. The sloping beams are the rafters. Hi Janek! Our timber house will consist of 3 single slopes roofs, no trusses. Do we still need a engineer? Danie plans must be drawn by a competent person, not necessarily an engineer. However the local authority might require an engineer.